Ross Controls, Troy MI, has introduced a 11⁄4-in. pneumatic automatic counterbalance for large mechanical presses. The new system can be integrated with existing press controls to set and maintain the correct pressure for each die set, thus improving part quality and extending press life, according to company officials. The counterbalance meets all ANSI B11.1 requirements and is available in a variety of port threads, voltages and electrical connections. Properly set counterbalance pressures on each production run eliminate gear and bearing clearances to reduce force loading, wear and motor loads. 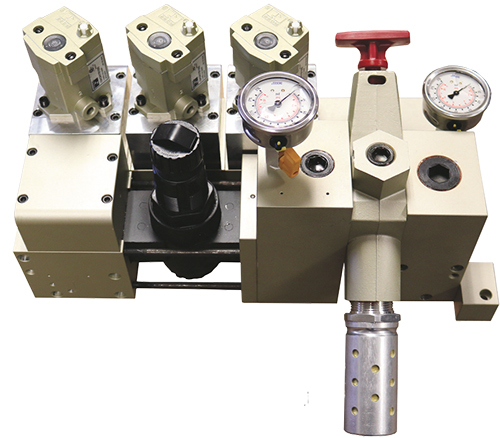 Two selectable modes of operation, manual or automatic using two-way poppet internals, provide positive shifting even in demanding low-flow applications. To ease maintenance and add flexibility, all solenoids and main valve internals are interchangeable and can be serviced from the top.